I’ll admit that in the past I have shied away from online class games. Our school is limited in WiFi availability and I have not wanted to either single out students who didn’t have phones, or ask them to use data to play. But the #langchat community is big on the Kahoot! – and I just had to join in. Basically you create a multiple choice quiz. When you start the game students see a ‘game code’ – they go to the web site and enter that code – create a team name – and you begin. I’ve tried to use it in my classes to both increase teamwork and minimize data use. Why do I like it and how do I use it in my classes? 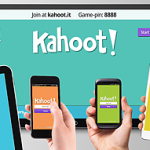 We play on a variety of devices – Kahoot! does not just rely on phones. It can be played on a variety of platforms. Although they are common – not all kids have phones and I don’t want to assume that they do. With 4 computers available to me in class – that’s 4 teams that don’t need to rely on data. In one of my classes I even had a group opt for the computers as they felt that they had minimal data left on their phones. Sometimes I’ll even bring my iPad to increase the ease of access for students. We play to both reinforce language points and to just ‘educate’ – Last semester I was seeing a lot of errors in a particular use of verbs in Japanese. We’d use it in context, we’d practiced it explicitly but I was not sure that they really ‘had it’. Kahoot! let me set up a way to check for learning – in a fun and relaxed environment. Playing in teams, and allowing 30 seconds for an answer, also meant that they could talk about the particular answer prior to ‘ringing in’. I also use Kahoot! to ‘learn’ about items. My first years do a Kahoot!, with partners, in English at the start of the year to see what they know about Japan and also begin to build class connections. It’s a passive way to see test prior knowledge as well as clear up some common misconceptions. We play for ‘speed’ and ‘skill’ – Questions in Kahoot! quizzes come with a point value associated with it. After each question the top team names are displayed – and there’s a lot of hooting and hollering as teams work to overtake the teams at the top. 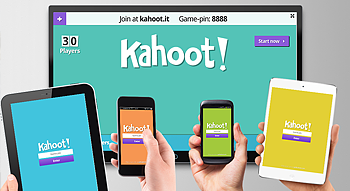 In Kahoot points are alloted based on a combination of speed of answering/correctness. My students think it’s all about the ‘winning’ but I know it’s all about putting something in front of them that they have to discuss, and find an answer to. They are reviewing, teaching and reinforcing learning during the game. We play occasionally – I don’t want to overuse this ‘game’ – in part because I like variety. I also don’t want to be relying on student devices that much – and taking a lot of data minutes for an in-class activity. If you haven’t already Kahoot!-ed its fun to try. For me the value is in the team-building that goes on – and the learning that it reinforces. Eventually I’m going to have my students make them for each other…! Thanks for the comment Amy – I’ve enjoyed the pair/team aspect – especially because I ask my students to be in partners all the time..and it has worked out well! Enjoyed your post!